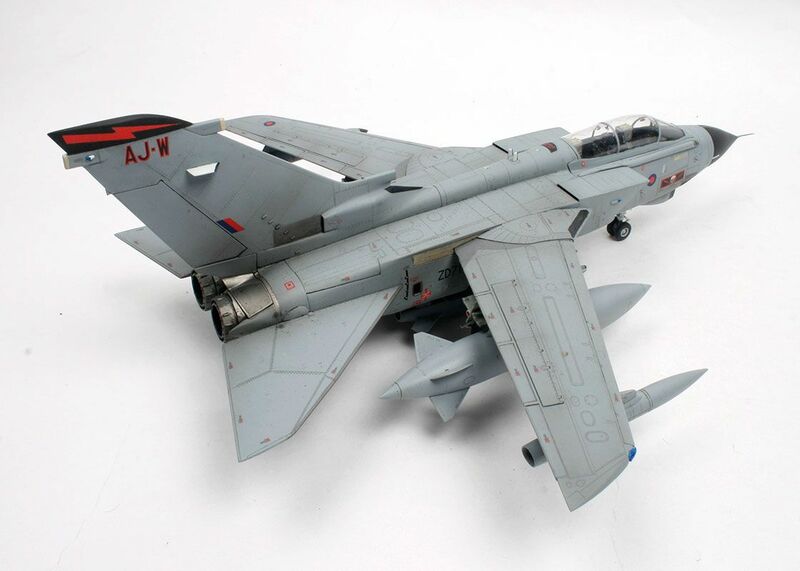 The Tornado has seen a lot of action in Royal Air Force service over the last thirty five or so years. For many its time in the skies above the Persian Gulf will be remembered as the Tornados finest hour. Since then they have been working for a living on a regular basis. 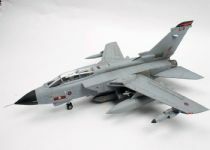 This has prompted many upgrades of both the aircraft itself and the weapons systems available to it leading to the current GR.4 variant. 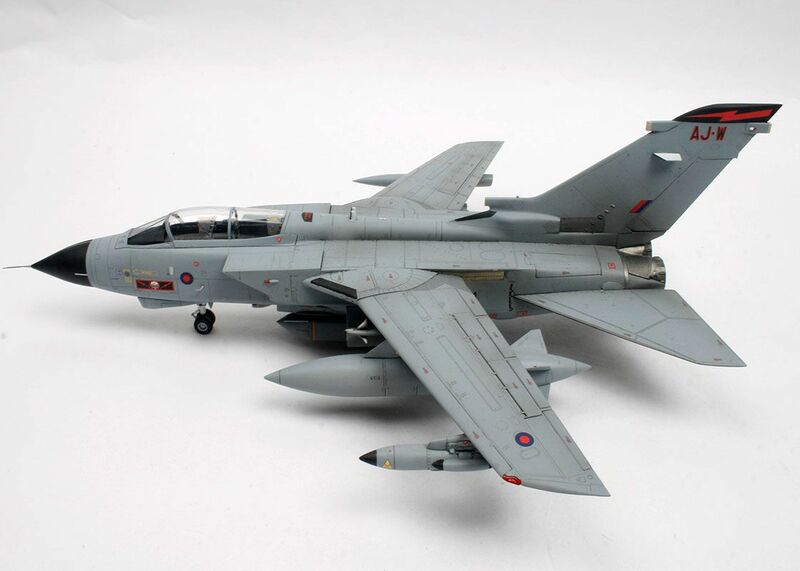 There have been a few 1/48th scale kits of the Tornado over the years the latest being from Revell. 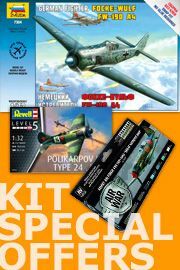 This release is a revised version of the IDS kit released a couple of years ago with a few new parts and decals relevant to a British aircraft. The kit consists of fifteen sprues of grey and one of clear parts, containing two hundred and sixty and twenty-two parts respectively. The decals are very nice with sharp printing and colours on the large sheet covering two options for a No.41 Squadron anniversary scheme and a No.617 Squadron aircraft. The box art and instructions are to Revell's new style. The assembly images themselves are still quite complex and at times difficult to follow but at least now the paint/decal pages are in colour. Speaking of colour we still only get matches to Revells own paint range with no less than six of the colours being mixed shades. Regarding the assembly there are quite a few options to decide on and keep track of in the form of open or closed canopy, air brakes, spoilers and thrust reversal buckets. Throw in drop or raised flaps and slats and you’ll get the idea. Most of the RAF parts in this kit were actually in the original IDS release but there are a couple of new sprues for the large drop tanks, spine and fuselage pylons. The first batch of kits released were missing the clear front for the laser ranger and marked target seeker (LRMTS) pod so I made mine from some scrap plastic carved to shape. 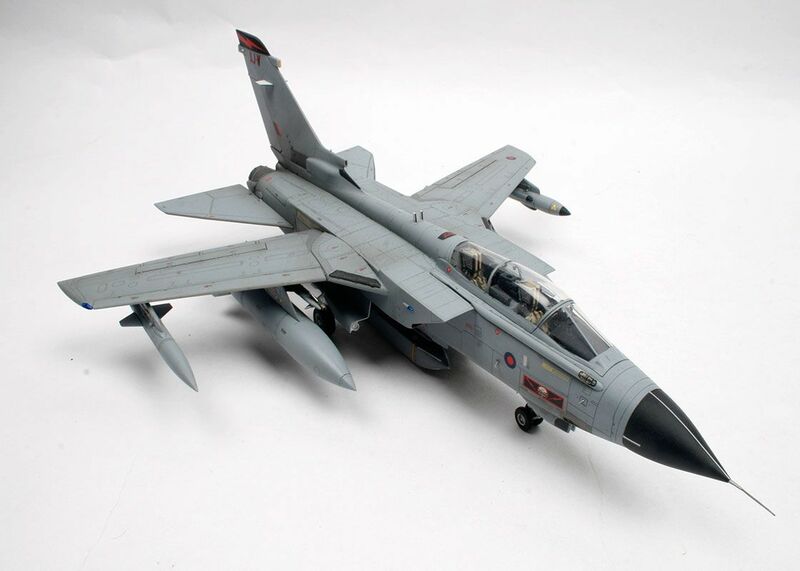 As this is the current GR.4 variant the one thing I was hoping to find in the kit was a relevant weapons fit, a sniper targeting pod, Brimstone missiles, Paveways or Storm Shadow cruise missiles. Unfortunately just the average Sidewinders, Boz and Skyshadow pods from the IDS kit are included. Luckily Eduard has come to the rescue with the release of a pair of superb Storm Shadows in their Brassin range, which fortunately arrived for review just at the right time. Having built the first IDS kit when it was released I already had some idea of what would be involved with building this one. The first model was built with the canopy, air-brakes and spoilers open and the flaps and slats dropped so with this one I went with everything raised or closed. With that decision made I could start putting the model together. 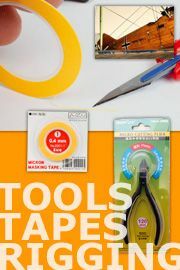 I began by working my way through the instructions opening any holes up where needed. This was followed with assembly of items like the intake trunking and jet pipes ready to be installed into the fuselage. The cockpit tub on the real Tornado is quite tidy and the kits reflects this quite well with raised details on the side consoles and instrument panels that paints up nicely. There are decals provided but they didn’t match the raised detail so apart from a few small sections for the most part it was out with the paint brushes here. The fuselage is quite complex in the way it’s been broken down to enable Revell to include the engraved detail on all the faces. With a little patience and three hands it does all go together very well needing very little in the way of filler around the underside joints. Moving onto the wings these are built up around the mechanism to pivot the pylons as the wings sweep. This does work with care but for the best results the wings need to be fixed in place at the desired angle. One thing to bear in mind is that if you plan to fit the big Hindenberger tanks the wings can’t be swept all the way back. The upper fuselage and intakes are now added followed by the wing gloves and tail section. The pivots for the tail planes are a bit on the loose side so when the tail surfaces were fitted they were fixed into position with a touch of Tamiya extra thin cement. Staying with the airframe the large fin was built up but be aware there is an error in the instructions. On the trailing edge above the rudder there is a small insert (part D79) which is drawn upside down. Unfortunately even the right way up the fit of this small part is awful requiring a bit of precision filling and sanding. The radome fits well but do remember to fit some weight in there first, you don’t need a lot but better safe than sorry. The control surfaces, flaps, slats, spoilers and airbrakes were added now which pretty much completed the airframe. As I was starting to think about paint the various pylons, doors and tanks etc. were cleaned up mounted ready for spraying. The cockpit, canopy and intakes were masked up with a combination of Tamiya tape and blu-tac now so I was all set. Saying that now I had to sit there looking through paint charts and reference books to determine which shades of Mr Colour I would use. The shades of grey used on British Tornados is a bit of a minefield. There are a few variations on the theme before you even start thinking about the temporarily applied schemes. In addition to this the colour of the radome can also vary so check your references and try to find a picture of the aircraft you intend to model. 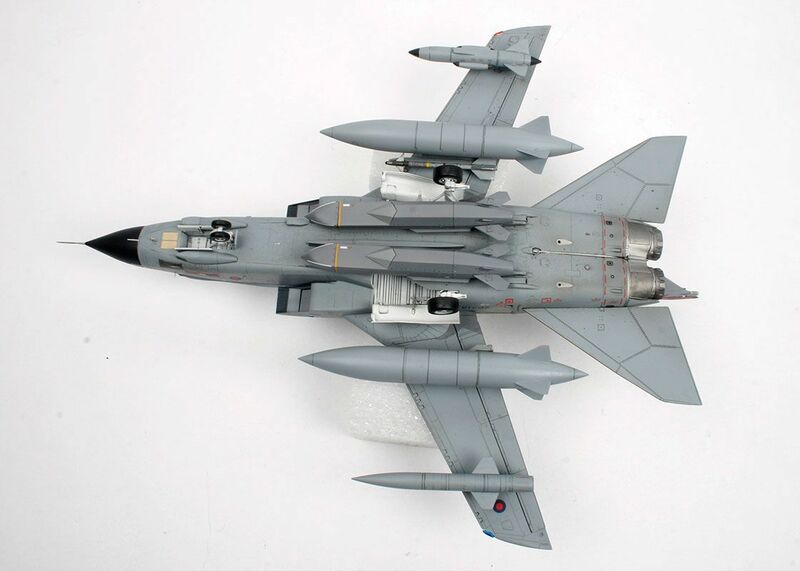 For example I had decided to build the No.617 Sqn option and the pictures of their GR.4’s in the book Horizons by Geoffrey Lee show them with Black radomes, not Grey as per the kit. So first up was some X-18 Black on the radome and canopy/windscreen. This was masked off and the whole airframe was given a coat of H307 Grey. The undercarriage bays were masked and sprayed H316 White before all the masking was removed. I now touched in the Grey wing sweep panels and a few other panels by hand. The metal panels were painted by hand using Games Workshop Boltgun metal and Chainmail acrylics. The whole model was given a coat of Johnson Clear ready for decals and a wash of Grey acrylic ink. You will need to do the decals over a few sessions as there are a lot of them but on the single colour paint scheme they make a big difference so it’s worth taking your time on them. With the decals on the ink wash was applied, focussing on access panels and control surface hinge lines. To give everything a chance to dry the undercarriage was built up and given a coat of pale Grey. To bring out the detail on the legs and undercarriage bays I used Mig productions Dark wash cleaned up with odourless thinners. The legs and all the doors could go on now allowing the model to sit on its wheels for the first time. The kits underwing stores and tanks were built and painted mostly Grey for a change before adding yet more decals. Something not mentioned is the fact there are two sets of markings for the drop tanks, one in red and one grey. A case of check your references again I’m afraid. The Eduard Storm Shadow cruise missiles went together well and once painted the decals provided were added. Being mostly resin I decided to strengthen the joint with the pylons using brass pins. It was time to start adding all the smaller bits and pieces that are likely to have been knocked off by now leaving just the canopy, lights and pitot aside. The whole model was given a coat of Vallejo satin clear to even out all the various finishes and seal in the decals. The canopy and lights were all fitted now with Pacer Formula 560 pva. All that was left now was the pitot which is something of a low point as its awful needing a lot of cleaning up to make it presentable. As I mentioned at the start this is the second of Revell's newly tooled Tornados I’ve built now and I have to say this version is just as good as the first. It’s not a simple build needing care, patience and three hands at times but it is worth the effort. Not only is it well detailed, the shape is right and just as important these days it is very reasonably priced. For me the only downside to the kit is the lack of any relevant weapons and of course the awful pitot tube. Would I do it all again? I could do with a desert Pink GR.1 so it looks like number three will be happening. Our thanks to Revell AG (UK Branch) for the review sample.